Cordage is a very important asset for many uses in campcraft and bushcraft. I usually think of campcraft as activities surrounding a campsite such as pitching a tent, tarp, hanging a hammock, setting up temporary convenience constructions such as improvised tables, chairs, clothes lines, etc. 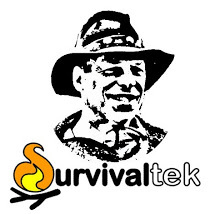 I think of bushcraft as being more related to survival skills such as constructing debris shelters, snares and traps, improvised weapons and fishing gear, and firecraft devices e.g. bow & spindle kits. It was the firecraft aspect of bushcraft that drew my attention to cordage as I was keen to learn fire-by-friction skills that required durable cordage while practicing this skill. Primitive living skills that I enjoy apply to bushcraft wonderfully but cordage can be a challenge due to the resources available. It can take time to process and there’s the question of durability for it’s use. For expedience sake I would practice with commercial cordage which is readily available and reliable. There are basically two types of cordage on the market: natural fiber and synthetic strand. If you visit a hardware store or shopping isle you can find twine and rope made of cotton, sisal, jute, manila or hemp. These are natural fibers with low stretch and grippy surfaces. The other cordage will be synthetic fiber made of materials such as polyester, polypropylene, and nylon. This cordage will be stronger and more durable but somewhat slippery. You will find their construction will fall in the categories of twisted, solid braid, or diamond braid. The diamond braid is a weaved sheath around a linear fiber core and is less durable than a solid braid. 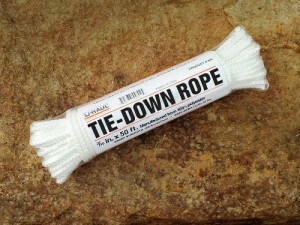 I usually preferred cordage used for small engine starting cord or drapery valence cord for bow & spindle practice for it’s durability but recently I came across this much less expensive tie-down rope that costs three cents a foot and wanted to share this bargain with other firecrafters and outdoor enthusiasts. Cordage is always good to have in your camping gear, vehicle emergency kit, Bug-Out-Bag, or household. By buying a variety of cordage you can become familiar with their properties and which one is appropriate for your applications. This entry was tagged Campcraft, Camping, Cordage, Firecraft, Rope. Bookmark the permalink.